Stewart Lee has been nominated for his third Chortle Award today: this time for best show. His Content Provider show is up against Because You Demanded It... the anti-Brexit show from his wife Bridget Christie. Also nominated are Richard Gadd's Monkey See Monkey Do, which won the Edinburgh Comedy Award at the Fringe last summer, Kieran Hodgson's Maestro, which was also shortlisted at the Fringe, and David Baddiel's My Family Not The Sitcom, which is currently running at the Playhouse Theatre in London's West End. That is the last category to be announced today. Now you can vote for your favourites across all the categories here. Polls close at 11am next Friday, February 24. 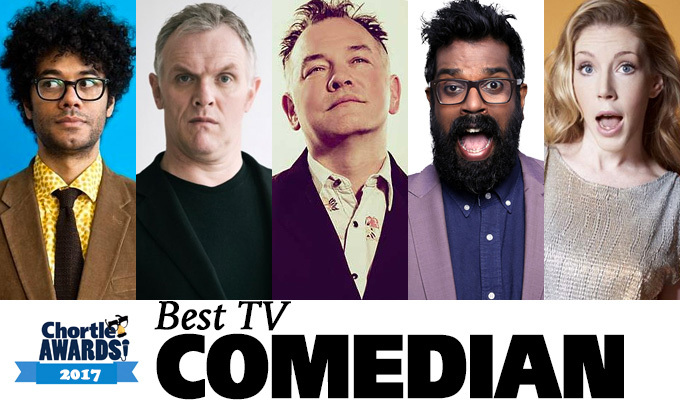 Stewart Lee and Romesh Ranganathan have been nominated for their second Chortle Awards today, after making the best TV comedian shortlist. Lee's BBC Two programme Comedy Vehicle is in line for the best TV comedy entertainment show, while Ranganathan's live show Irrational is up for best tour. Also on the best TV comedian shortlist is Greg Davies – whose Taskmaster was also up in the TV comedy entertainment category ≠ Richard Ayoade and Katherine Ryan. Deborah Frances-White has a second Chortle Award nomination. 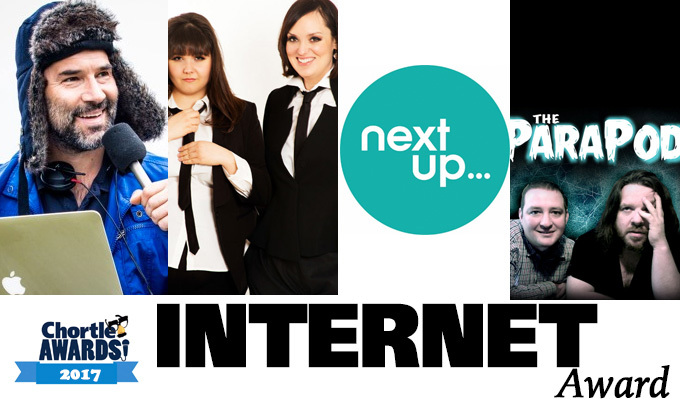 The Guilty Feminist, the podcast she hosts with Sofie Hagen, has been shortlisted for the internet award alongside the Adam Buxton podcast, NextUp and The Parapod. The latter features believer Barry Dodds and sceptic Ian Boldsworth investigating various otherworldly phenomenon and conspiracy theories; while Buxton's podcast has him in conversation with other performers and writers. NextUp is a new subscription-based comedy-on-demand video service featuring many of the new wave of comedy stars, and has been likened to a Netflix of stand-up. Deborah Frances-White Rolls The Dice was earlier nominated for the radio award. 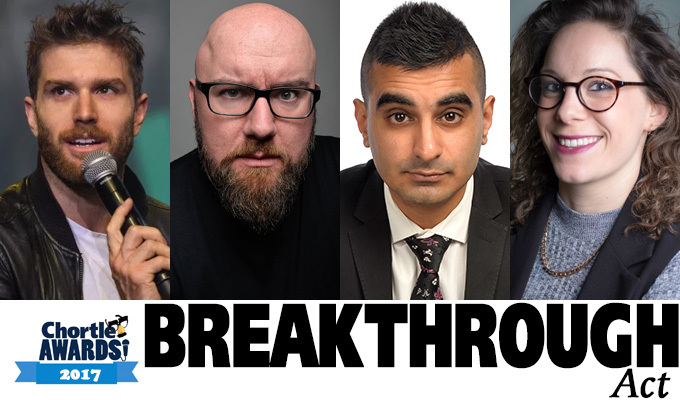 Scott Gibson, Joel Dommett, Tez Ilyas and Suzi Ruffell have been nominated for the Breakthrough Award. Gibson scooped last year's Edinburgh Comedy Award for best newcomer for his show Life After Death, despite having no industry backing. Dommett has suddenly found a larger audience thanks to his appearances on I'm A Celebrity – but also continues to impress with his zestful stand-up shows. Elias is starting to make media appearances on the likes of The Now Show and Virtually Famous, while Radio 4 has commissioned his own stand-up show Tez Talks, and he made a short film for Sky Arts last year. And Ruffell has been developing as an act over the past 12 months with her last show, Common, about her dodgy family history and working class roots, winning critical acclaim. Fleabag has notched up two more nominations in this year's Chortle Awards. 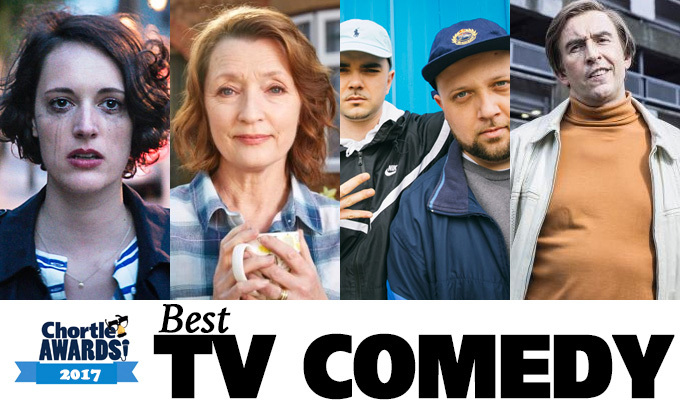 The show was already up for best TV comedy – see below – and now its star and creator Phoebe Waller-Bridge us up for best TV actor, alongside her co-star Olivia Colman, who is jointly nominated for her role in Channel 4's Flowers. 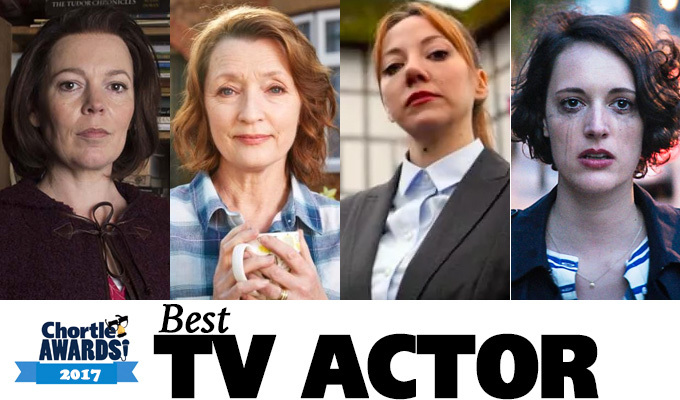 Also shortlisted are Lesley Manville for Mum – which, too, is up for best TV comedy, and Diane Morgan for her role in the BBC One pilot Motherland as well as Philomena Cunk. 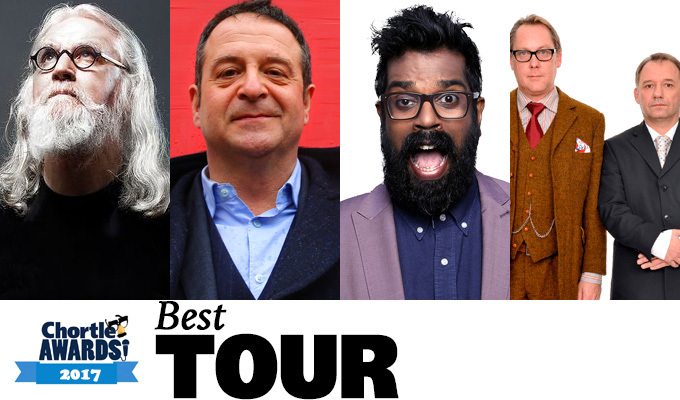 Billy Connolly, Romesh Ranganathan, Reeves and Mortimer and Mark Thomas are up for best tour. Connolly's High Horse tour started in Scotland in 2014 and covered the rest of the UK last year, while at the other end of the spectrum of touring experience, Ranganathan is shortlisted for his debut tour, Irrational. Thomas is nominated for his show The Red Shed, about the Wakefield Labour Club where he had his political awakening. Reeves and Mortimer took to the road last year for their first tour since 1995, for a show entitled,tongue-in-cheek. Poignant Moments. 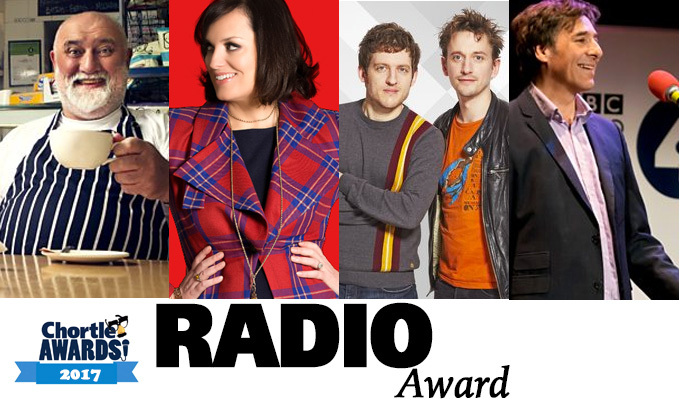 Alexei Sayle, Elis James and John Robins, Deborah Frances-White and Mark Steel have been nominated for this year's Chortle Radio Award. Alternative comedy legend Sayle is up for his Radio 4 show Alexei Sayle's Imaginary Sandwich Bar, which was a mixture of stand-up, memoir and philosophy. James and Robins are up for their Saturday afternoon Radio X show, two years after they became the first non-Radio 4 show to be shortlisted in this category. Deborah Frances-White is up for the second series of Rolls The Dice featured true-life stories about finding her birth father and saving a man from the Jehovah's Witness. And Steel is up for his long-running show In Town, in which creates a bespoke stand-up set for each place he visits. 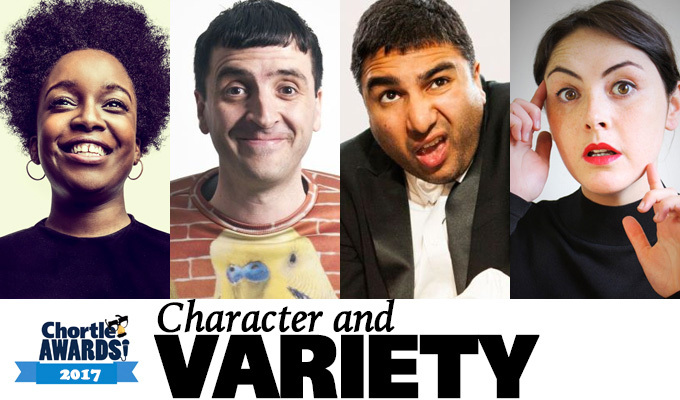 Lolly Adefope, Spencer Jones, Nick Mohammed and Emma Sidi have been nominated in the character and variety section. All four had acclaimed Edinburgh shows last year, Adefope and Sidi with multi-character showcases, Jones with his daft alter-ego The Herbert, and Mohammed as his alter-ego Mr Swallow in a show recreating one of escapologist Harry Houdini's most famous stunts. That show is currently running at the Soho Theatre, which hosts Sidi next month. Fleabag could add to its impressive tally of gongs after being nominated for best TV comedy. Phoebe Waller-Bridges's acclaimed BBC show is up against Mum, People Just Do Nothing and Alan Partridge's Scissored Isle. The Sky Atlantic programme is the second nomination today for Partridge, as Nomad is up for the book award, as well as being the only non-BBC show in this category. Mum starred Lesley Manville as Cathy as she moves on from the death of her husband – and BBC Two has already ordered a second series from writer Stefan Golaszewski. People Just Do Nothing, about the crew of a West London pirate radio station, aired its third series on BBC Three last summer, and a fourth is expected later this year. 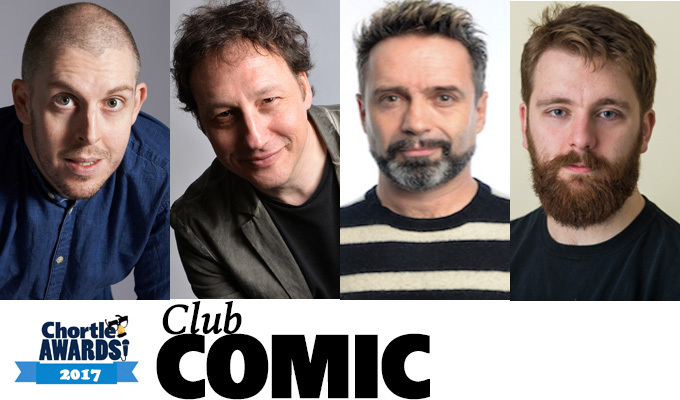 Carl Donnelly, Carey Marx, Phil Nichol and Pierre Novellie have been nominated for best club comic. It is a record sixth time that Nichol has been shortlisted in this category, previously called best headliner. Donnelly was previously nominated for the award in 2015, when it was won by Katherine Ryan, and Novellie was up for it last year, when Zoe Lyons won. But it is the first time Marx has been nominated in his more-than-15-year career. The Dave channel dominates the shortlist for best TV comedy entertainment. 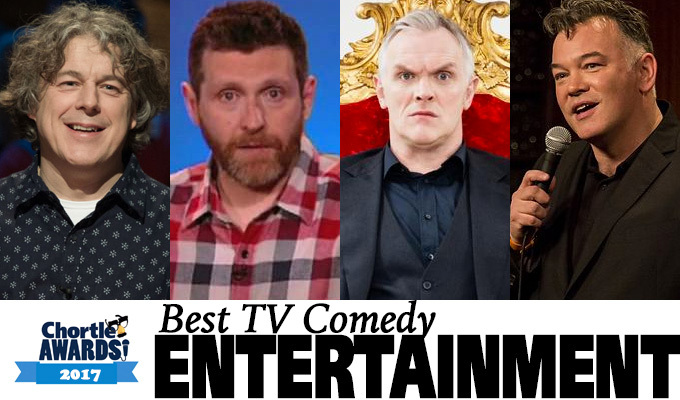 Three of the four nominated shows were commissioned by the broadcaster: Alan Davies's As Yet Untitled, Dave Gorman's Modern Life Is Goodish and Taskmaster, with Greg Davies and Alex Horne. The only non-Dave programme in the list is the final series of Stewart Lee's Comedy Vehicle, which aired on BBC Two. Alan Partridge, Sara Pascoe, Shappi Khorsandi and Isy Suttie and have been nominated for this year's Chortle Book Award. Partridge – or rather his writers Rob Gibbons, Neil Gibbons and Steve Coogan – are shortlisted for Nomad, in which the radio presenter embarked on a meaningful walk from Norfolk to Dungeness, nominally in honour of his father. Pascoe is in the running for Animal, a tour of the female body using biology, sociology and a lot of humour to speak about women's issues. 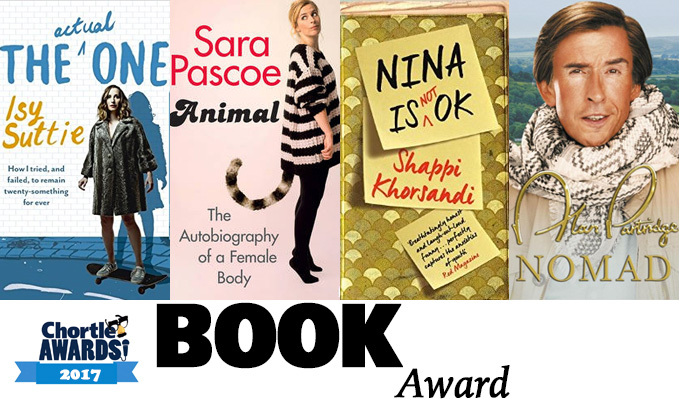 Khorsandi's debut novel, Nina Is Not OK, revolved around a teenager with a drink problem, and revolved around the issue of social media shaming; while Suttie's The Actual One is an autobiographical account of young love. 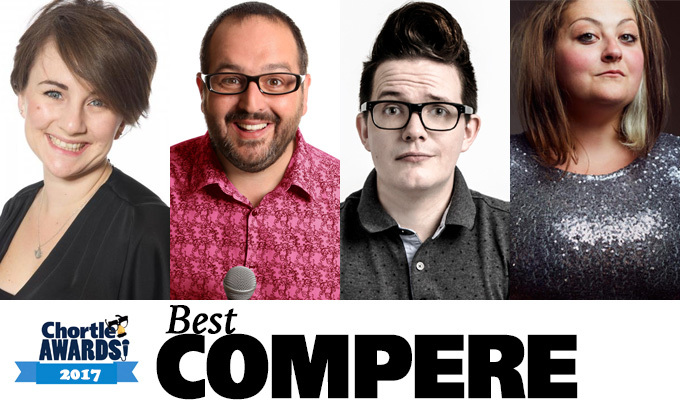 Laura Lexx, Justin Moorhouse, David Morgan and Kiri Pritchard-McLean have been nominated for best compere. Last year Lexx hit the headlines when a video of her putting down a sexist heckler at Brighton's Komedia venue went viral. Morgan and Pritchard-McLean were both nominated for the same award last year – although the title ultimately went to Jarred Christmas for the second time. But this is the first nomination for Moorhouse, despite being a well-established MC at clubs such as the Comedy Store. 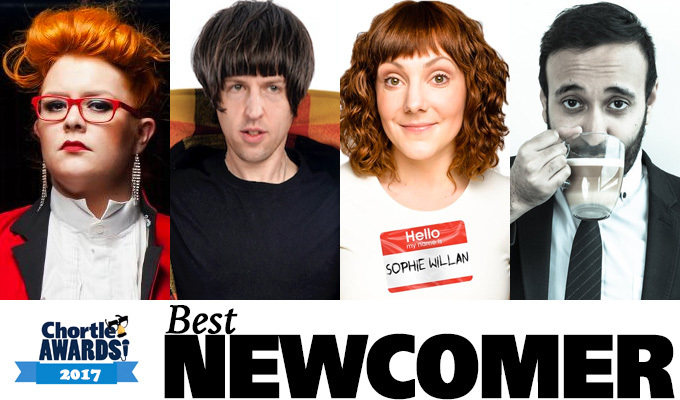 Jayde Adams, Tom Ward, Sophie Willan and Bilal Zafar have been nominated for best newcomer. Adams and Zafar were previously nominated for best newcomer at last year's Edinburgh Fringe, Adams for her show inspired by the death of her sister, Zafar for his about winding up racist trolls on Twitter. Willan also grabbed attention at last year's Edinburgh Fringe for her show about being in and out of care as her mother was a heroin addict. While Ward has previously made the finals of the BBC Radio New Comedy Awards and the NATYs. Details of the ceremony when the winners will be announced have not yet been confirmed. The panel who drew up the shortlists comprised Chortle editor Steve Bennett; Alice Jones, arts editor of the i; Tania Harrison from Latitude and Leeds and Reading festival producers Festival Republic; Julia Chamberlain from Jongleurs and So You Think You're Funny; journalist Claire Smith, who reviews for the Scotsman; and Bruce Dessau from the Evening Standard and Beyond The Joke; with additional contributions from comedy journalist Jay Richardson.